Be on your way to a healthy heart. Subscribe to Harvard Heart Letter today. Each month, you’ll get easy-to-try nutrition and exercise advice that will improve your heart’s health and overall well-being. 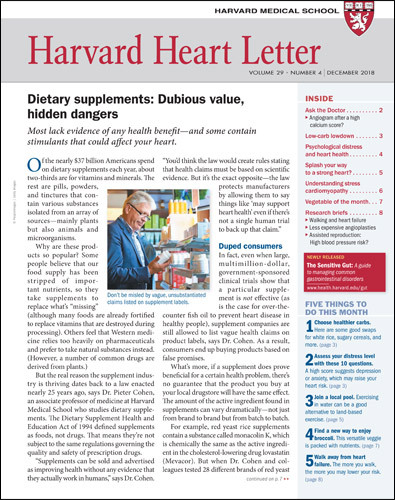 In Harvard Heart Letter, you’ll also read about today’s breakthrough medications and treatments as well as advice from Harvard’s doctors on side effects, drug interactions, and surgery precautions. Lower your blood pressure! Eat more soy to prevent a stroke! Increase your intake of omega-3’s! Exercise 30 minutes a day! Every day, you hear such advice and more. But is it all beneficial for you and your heart? And what are some simple ways to follow these recommendations? And are there alternatives better suited for you? A subscription to the Harvard Heart Letter will help answer these questions…and help your heart! Each month, the doctors at Harvard Medical School give you the latest advice and recommendations in the pages of the Harvard Heart Letter. Easy-to-read, clear, and concise, Harvard Heart Letter is like a monthly conversation with your favorite doctor. Start your subscription today and be on your way to a healthier heart! The following reviews have been left for this newsletter. Log in and leave a review of your own. From the editors of the Harvard Heart Letter. The following are links to online information mentioned in past issues of Harvard Heart Letter or to extra information we couldn't fit into the printed version.